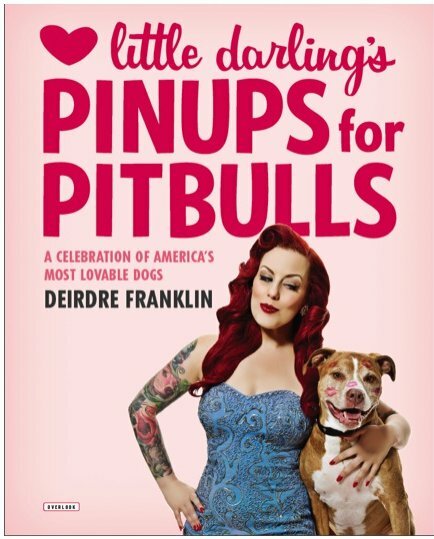 ASHEVILLE – When Deirdre Franklin saw the display at the Biltmore Park Barnes and Noble store for her Saturday book-signing event, all she could think about was how her book will spread the message of her nonprofit, Pinups for Pitbulls. “All I want in the world is for people to understand that they’re just dogs. They’re individual dogs who deserve a chance. This being out there is the best thing that could happen to this cause because people are going to pick it up and they’re going to learn something, and it’s just snuck right in between some really happy pictures,” she said. Published a few weeks ago by The Overlook Press, an independent publishing company based in New York, Franklin’s new photography book “Little Darling’s Pinups for Pitbulls” is a visual extension of the work her organization has been doing for nine years. 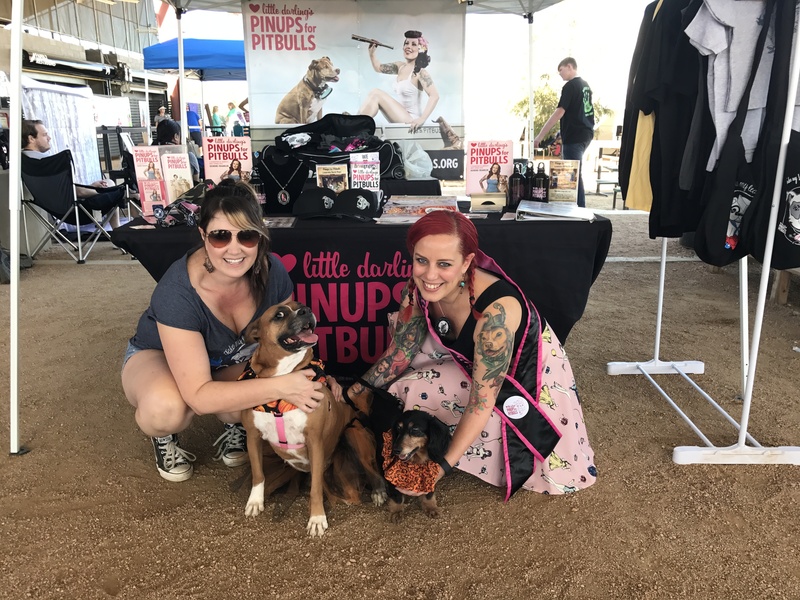 Pinups for Pitbulls is not a rescue organization, Franklin said, but instead works to set the record straight when it comes to modern myths about the breed by providing educational materials and training resources for all dog owners and all people. PFPB raises funds through sales of our exclusive merchandise, hosted events, auctions of donated art work, and donations from our thousands of fans. As PFPB is a registered 501c3 not-for-profit organization, all of the money raised returns directly to the cause. Our tax returns and accounting are transparent, and everything we do is accomplished with the dogs in mind. First and foremost, we are a group of humane educators. PFPB works alongside dog trainers, behaviorists, rescue organizations, and other animal welfare groups to obtain only the most recent, well researched information possible. Funds are used to create educational materials, train our staff of volunteers, and host educational seminars and programs for the public. PFPB believes that education is the key to combat breed discrimination, animal cruelty, and pet over-population. In its most recent collaboration with Kansas-based Game Dog Guardian, PFPB has created a new and cutting-edge set of educational materials and quick fact guides that will help any dog owner or animal lover effectively and logically defend their companions against breed discriminatory laws that threaten their cities and towns. With Game Dog Guardian’s help, PFPB hopes to enter schools and city parks to educate about proper dog ownership and humane treatment of animals in order to reduce abuse and animal fighting nationwide. PFPB also directly helps dogs in need. Most recently, PFPB’s Little Darling was on the front lines of the Winslow Township dog hoarding bust, helping humane law officers handle, treat, and re-home over thirty pit-bull type dogs seized from one property. PFPB has also assisted in numerous emergency rescue situations, pulling dogs from high-kill shelters, and sponsoring others that rescuers could reach them in time. We believe that all dogs can be rehabilitated, and all dogs deserve a chance. PFPB has sponsored the health care and veterinary bills for countless dogs over the years, including victims of severe cruelty Willie and Kate who suffered axe wounds to the skull before they were rescued, and Leonidas the Brave, a puppy who was dangled over a fence as bait for fighting dogs, losing two of his limbs. PFPB will support any rescue organization or shelter that is pit-bull type dog friendly, practices humane training methods, and believes that each life is worthy of its time. PFPB supports positive reinforcement training, smart dog handling methods, and an overall sense of proper dog ownership. Partnering with other humane educators such as the star of Animal Planet’s Pit Boss Luigi “Shorty” Rossi and author of the bestselling book Oogy: the Dog Only a Family Could Love Larry Levin, PFPB raises awareness for the plight facing pit-bull type dogs and shelter dogs in the world today. Through its efforts to garner positive media attention and draw crowds at its events across the country, PFPB hopes that every person that they can reach with their message will embrace it, share it, and help to change the current status for pit-bull type dogs around the world.